Designation (also Keltern) both for the process of pressing the grapes, as well as for the necessary mechanical devices. Presses were already in the early antiquity what finds of several thousand year old artifacts in many old wine regions prove. Among other things, the Roman writer reports Cato the Elder (234-149 BC) about it in his works. The pressing is a crucial step of the winemaking, As a rule, only healthy and physiologically mature Grape groves are processed, which is done by preparatory work such as selective vintage is accomplished. Depending on the type of wine must be decided, whether already before pressing a stemming (Dehacking, Rebeln) takes place, that is, whether the grape skeleton should be removed. When pressing the grape excreted from the grapes by mechanical pressure. Depending on the type of wine, it is separated from the solid components and then further processed, especially in the White wine, where usually the pressing is done as a first step. In the Red wine production This will be only after the classic maceration carried out. If the combs are mitgekeltert, they give tannins (Gerbstoffe) and pigments (Dyes), which may well be desirable in grapes with a strong fruit taste or in the red wine preparation, for example by the technique Macération carbonique is common. The grapes should be processed as gently as possible by minimizing mechanical influence in order to avoid the unwanted proportion of turbid (smallest suspended matter from berry peel and pulp) and the tannin content in the must keep as low as possible. In modern cellar technology, it is therefore attempted to use natural gravity for the movement of grapes and must instead of pumping. Each pumping action increases the amount of turbidity up to 1%. In this regard, the most gentle are pneumatic tank presses. By using the most modern pneumatic presses and the frequent whole-grape pressing intact grapes are processed, since the gentle pressing process, the combs are not crushed and no risk of too much tannins in the must. Depending on the variant, the grapes (with or without combs) are then squeezed or ground, the berries thereby broken and thus facilitates the juice exit. The desired intensity can be set variably. An ancient form of bruising is that pounding of grapes with bare feet in a container. Occasionally this is customary even today in southern countries, for example in the production of port wine, The result of stewing and squeezing is called mash. In the red wine preparation is now without pressing the maceration a, in the white wine production is now pressed. For an optimal course of the fermentation must have a corresponding must treatment respectively. In the so-called basket presses The pressure on the plate is accomplished either manually or mechanically with a rotatable spindle. The disadvantage is the relatively small capacity, but especially the strong oxidation and the big problems or effort in keeping clean. The advantage, however, is the relatively low because very slow, gentle pressure. In the Champagne For this reason, in some houses special basket presses are traditionally still mandatory for the production of the best champagne qualities. Today, mostly (especially in larger companies) horizontal presses are used. In the screw press mash is constantly filled at one end, the juice flows through sieve walls, and at the other end exits the squeezed pomace. This is used in large wineries, especially in bulk wines, because a high must yield of up to 85% correspondingly lower quality is achieved. Other conventional types are spindle , screw or toggle presses . In these, a movable plate in the basket is pressed against a fixed end plate, or two movable plates move towards each other. These hydraulic systems are today the most commonly used presses. 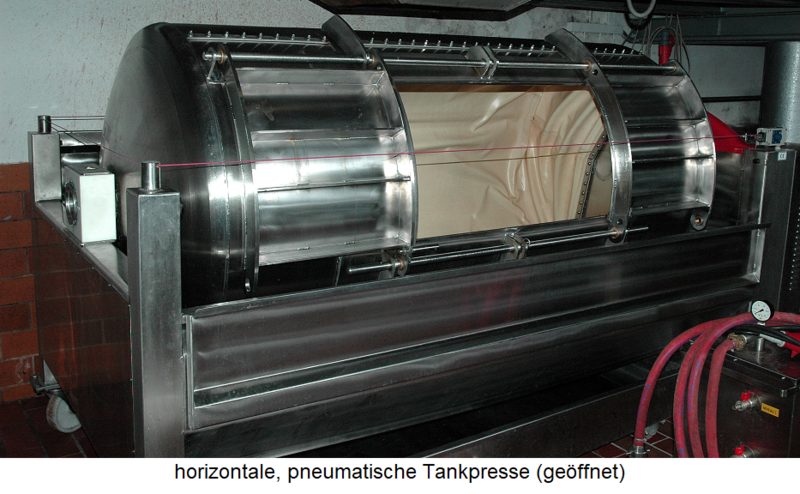 The pneumatic hose press inflates a long press hose located inside a container, forcing the mash against the walls. Since a much higher pressing area is given here, the berries are treated more gently and get less tannins (Tannins) in the must. These presses combine the advantage of the tree press (low pressure) with also low oxidation and germ free. In addition, they can be charged with variable quantities. A further development is the pneumatic tank press . These can also be used inert gas (Protective gas) are filled to the oxygen keep. There are also variants with perforated outer sheath, which are particularly suitable for white wine. The whole cluster pressing is a pressing process in the production of White wine and sparkling wine basic wine, It only became popular worldwide with the widespread use of pneumatic presses or tank presses. At the same time, the whole grapes are left intact without previous stemming or squeezing. A mash stage is switched off. Traditionally this is used in the production of champagne used, since in this case the blue grapes no dyes and no tannins to give to the must. The must obtained in this way produces a delicately aromatic, fine fruity and varietal Wine with a slightly higher acid content. However, the must yield is lower by up to 10%. Due to the large pressing surface and the resulting low pressure, no parts of the bladder (grape skin) get into the must, in which, even with white grapes, flavors and flavorings are. Therefore, it must be accepted that the total extract is reduced, which can lead to expressive wines. To prevent this, sometimes only a part of the grapes is processed in this way. The process requires years of experience. In the production of champagne and Crémant it is mandatory. Even before pressing runs through the weight of the grapes run juice (Seihmost). It accounts for about 30 to 50% of the total volume, consists mainly of sugar, must acids and some extractives, but is low in tannins. The obtained with low to medium pressure Most Press makes up about 40 to 60%. He is extrakreicher and contains many tannins and minerals. Precursor and pressed must complement each other and are processed together to produce a strong, tasty wine. The result of the last pressing operations, which must already be done with relatively high pressure, is called Most funeral, The amount is only 5 to 10%. This must has a multiple of oxidizable sediments. tannins and oxidases on. The latter are responsible for the tanning, which is why one sulphurize must be done. Should it be added to the main must, there is one Gelatin treatment required. In most cases, however, it is processed separately and delivers a tannin-rich wine of inferior quality or it is fired. In the production of champagne Only the best press results ( Cuvée and waist ) used. This page was last modified at 2 April 2019 at 07:56.